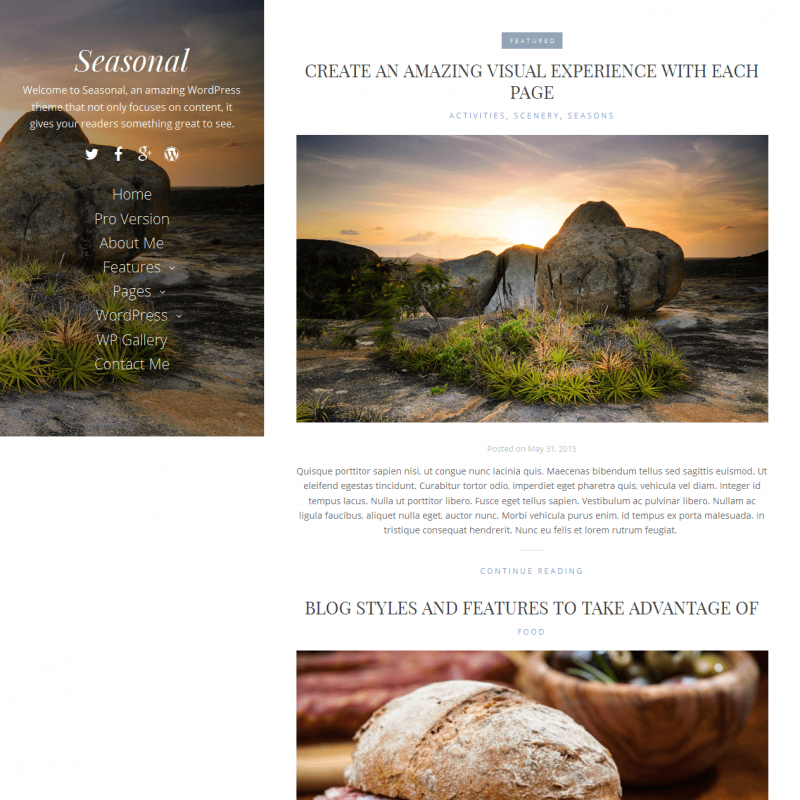 Seasonal is a fully responsive theme created for personal blog sites. The theme allows you to change the width of the left fixed sidebar, add a background color or even upload a custom background image. You can adjust background overlay opacity that darkens or lightens the sidebar. The Seasonal theme supports 2 blog layouts, 5 widget areas, 2 page templates. The theme comes with a wide range handy features, for example you can change font size via Customizer for any text on your site, change any color, show or hide some elements, and much more. Seasonal theme supports Schema.org microdata. 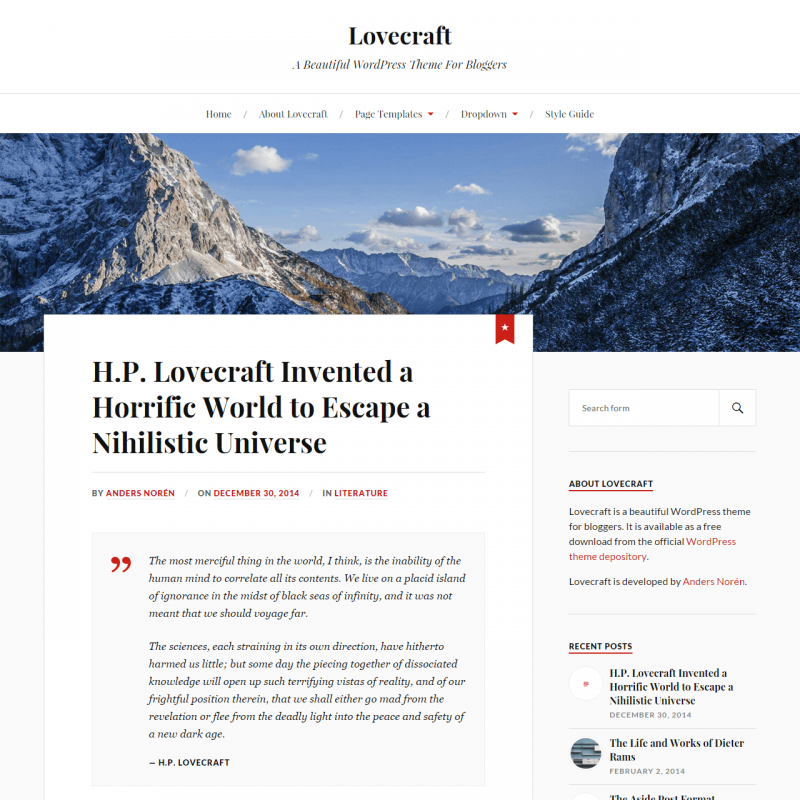 Lovecraft is a clean carefully crafted theme for any kind of bloggers. With WordPress Live Customizer you may upload your image logo, switch the default header image, change the accent color. You can choose between fullwidth and right sidebar templates for static pages. The theme comes with four widget areas and supports Jetpack Infinite Scroll function. You can also use the famous Jetpack Tiled Galleries to display post galleries in a beautiful grid. 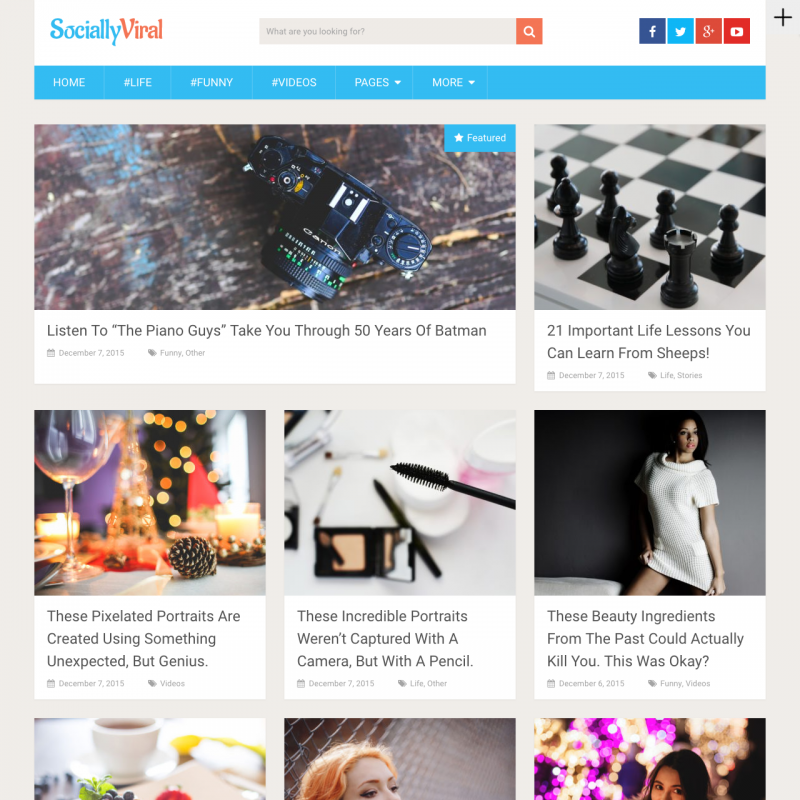 Sparkling is a solid WordPress theme for any kind of bloggers. It includes a featured slider, social icons integration, about author box, custom popular posts widget and improved category widget. Sparkling theme provides a bunch of options for design customization. Change colors, typograpy, add your Call to Action, footer copyright information, etc. The theme is translation ready, compatible with WPML and available on different languages. 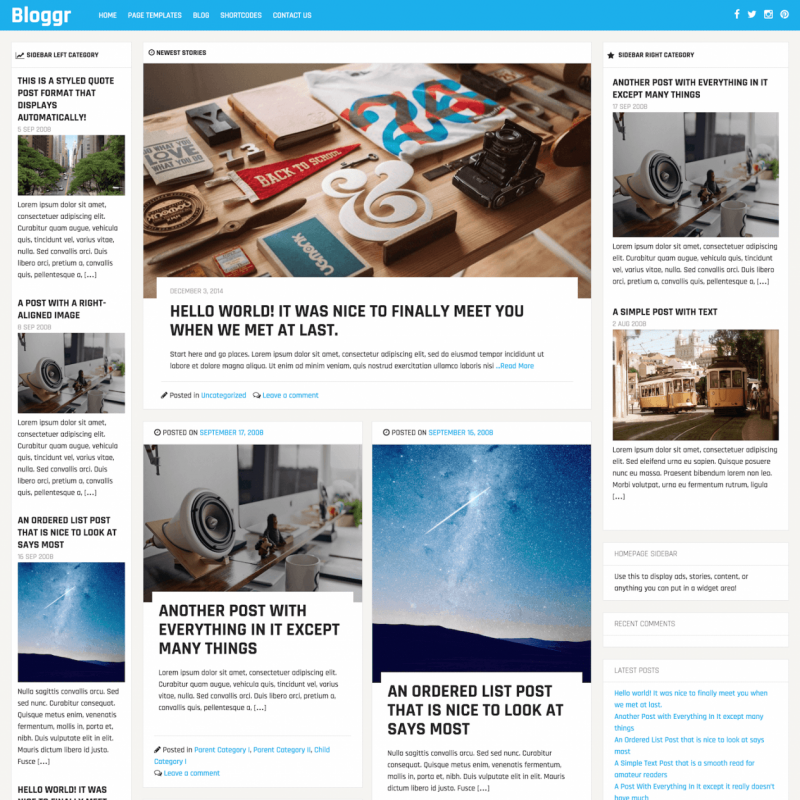 Bloggr is responsive theme with classy design. It is a good choice for blogs and magazine websites. You may add your own image logo and define its width, add links to your social profiles, change your website colors and upload background image. Also the theme provides some options for homepage. The theme is ready for translation. You should login on the author website to download the theme. 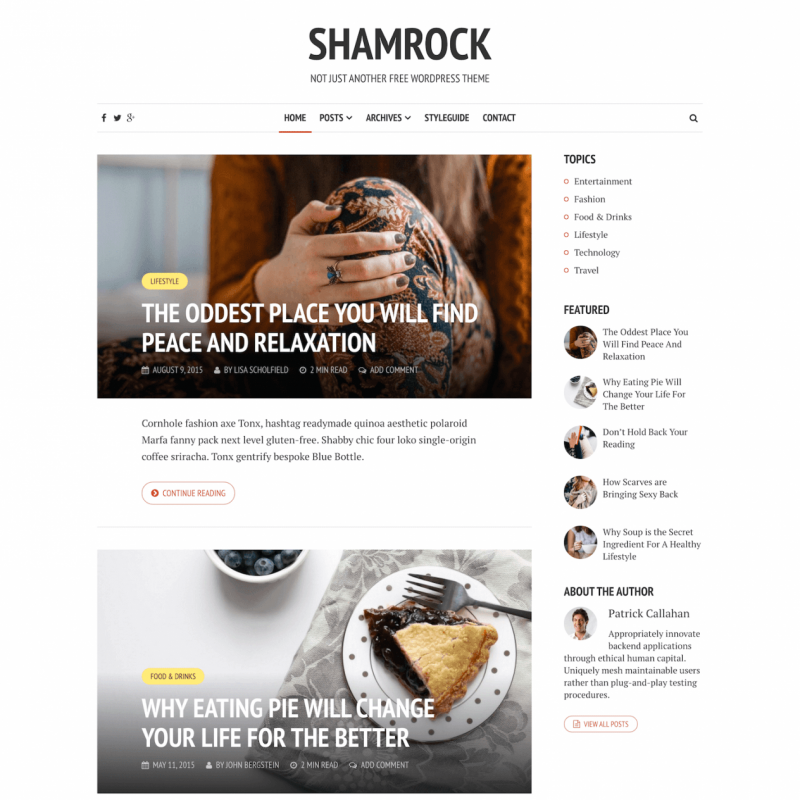 Shamrock is a clean blogging theme with a stylish design. You may upload your image logo, enable or disable site description, social links and search in navigation. Easily change website colors including background, fine-tune blog and single posts look. 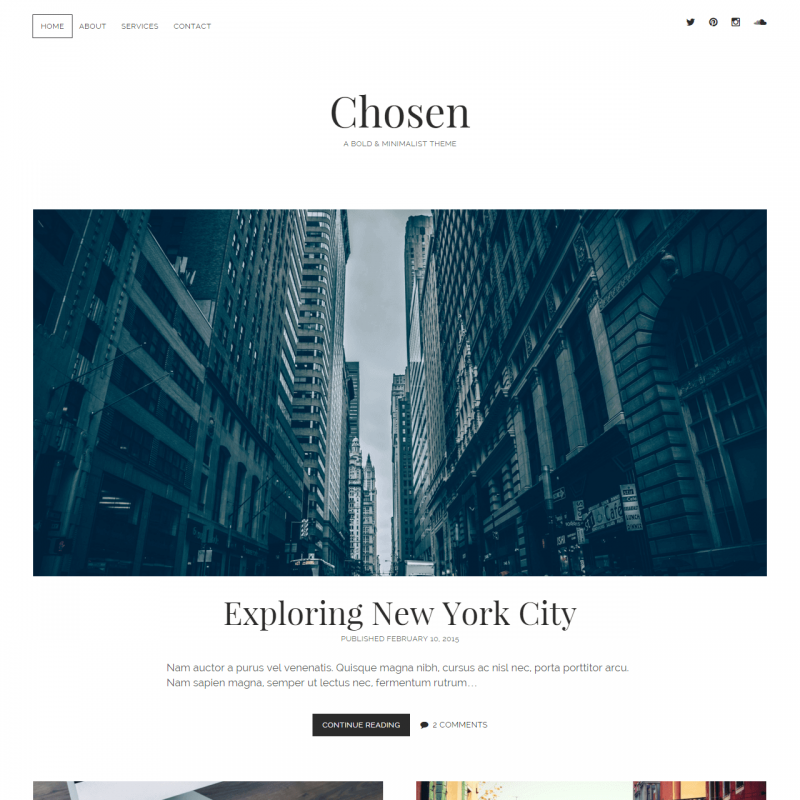 Chosen is a free minimalist theme for online magazine or blog. The theme is responsive, it supports social icons and navigation between single posts. 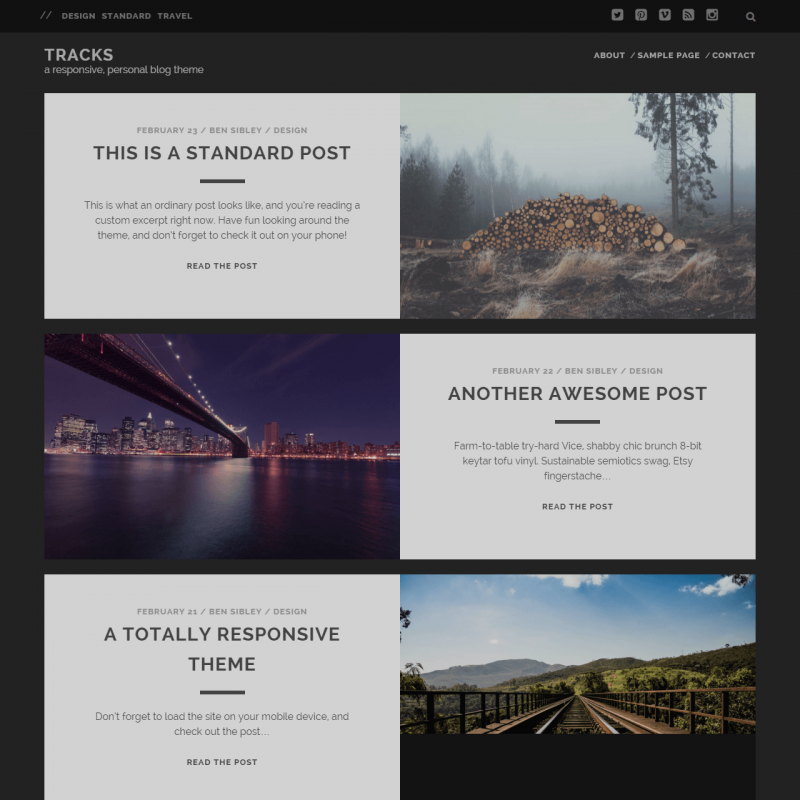 Tracks is a clean responsive blogging theme theme with a unique layout. The theme provides some customization options such as logo upload, social media icons, comment display controls and more. 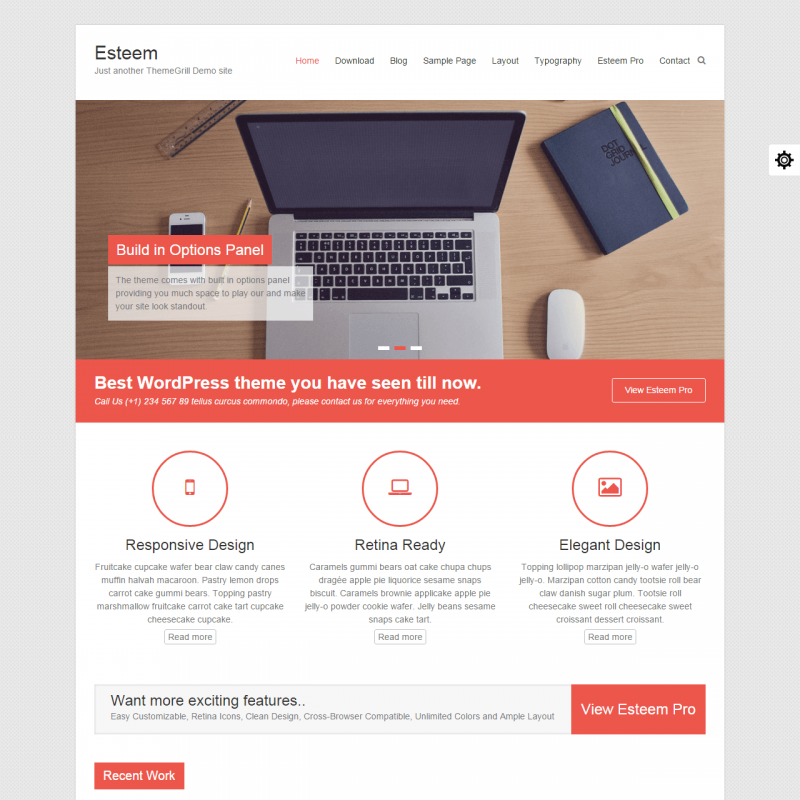 Esteem is a vivid clean responsive WordPress theme for corporate or blog websites. You may use custom header, custom background, 5 custom widgets, primary color, upload you image logo. Also you may select boxed or wide site layout. 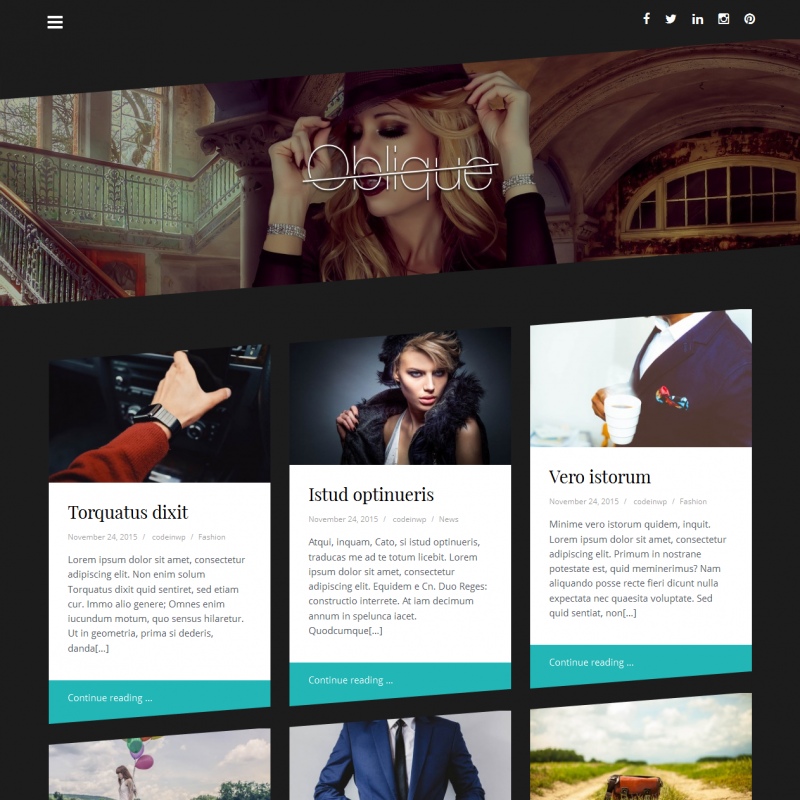 The theme provides 4 custom page templates: Left Sidebar, Right Sidebar, Fullwidth and Narrow Centered Content. 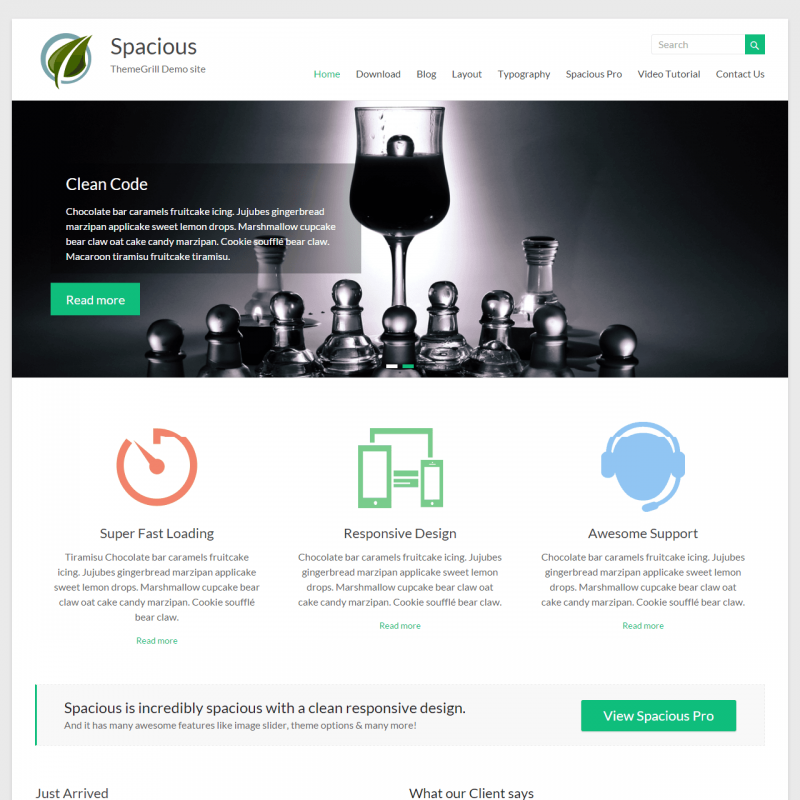 Spacious is a multi-purpose responsive WordPress theme. The theme provides 4 page layouts, 4 variations for blog posts, 13 widgets areas and 5 custom widgets a business website may need. You can change the primary color, choose between boxed or wide layout, use light or dark color skin, add your own logo, custom background and header image. 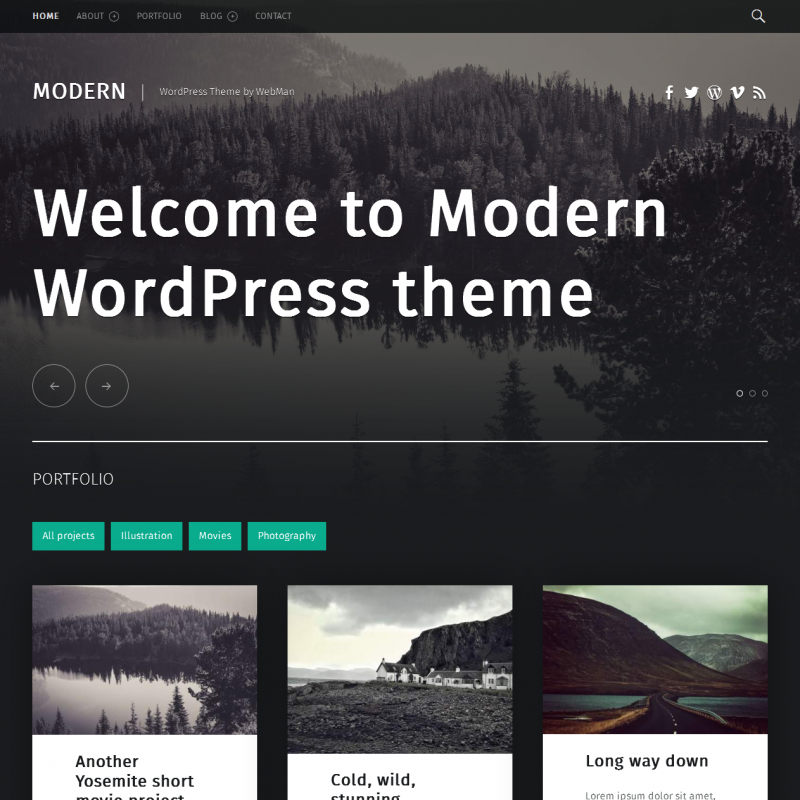 The theme includes featured image slider with custom links. Author is designed for bloggers and it’s accessibility-ready. 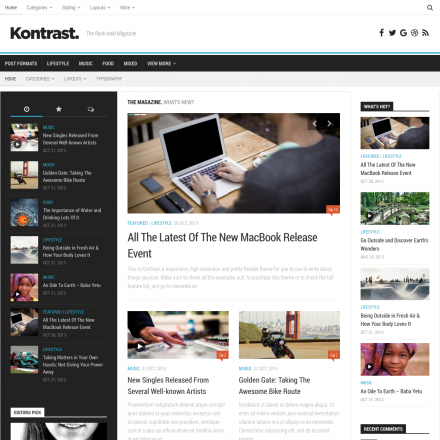 This theme provides good performance and readability. You may add drop-down menu, social icons, author avatar and any widgets to the left sidebar column. 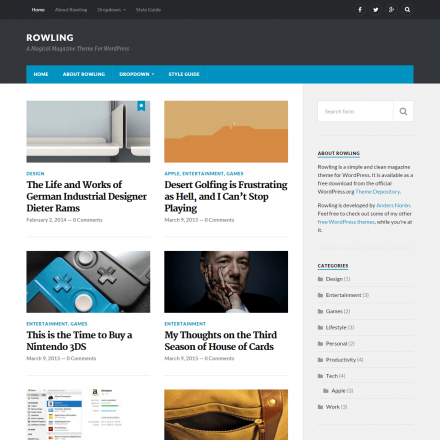 The theme is responsive and Retina-ready. 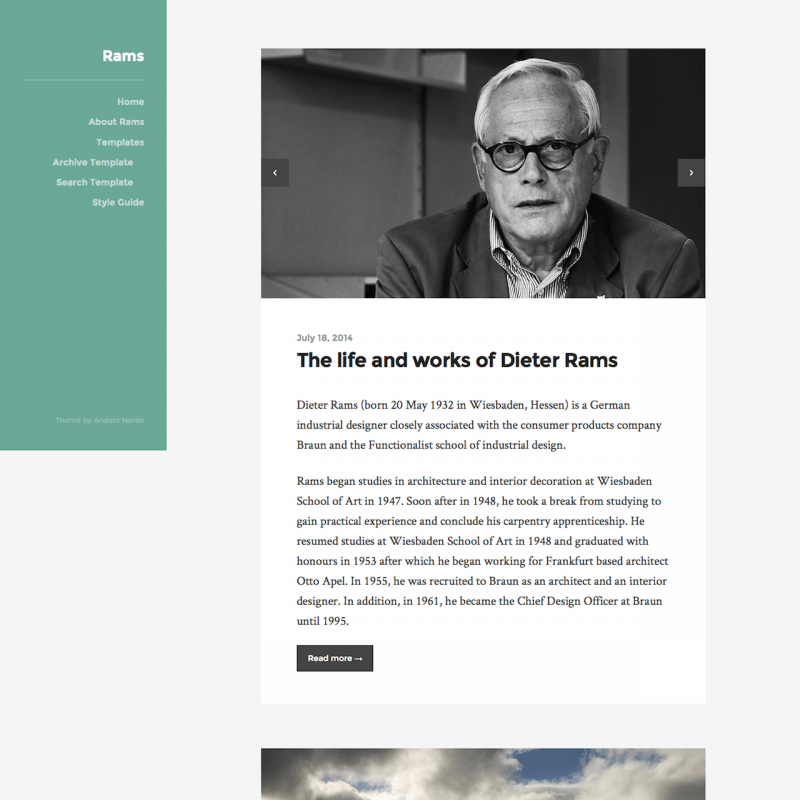 Rams is a minimalist theme for bloggers and writers. The theme supports gallery and quote post formats, provides integration with Jetpack Infinite Scroll and Tiled Galleries. The theme is very simple in use, there are no widget areas, the only one option included is a color control. You can change the background color for left side fixed menu and the accent color of the content. 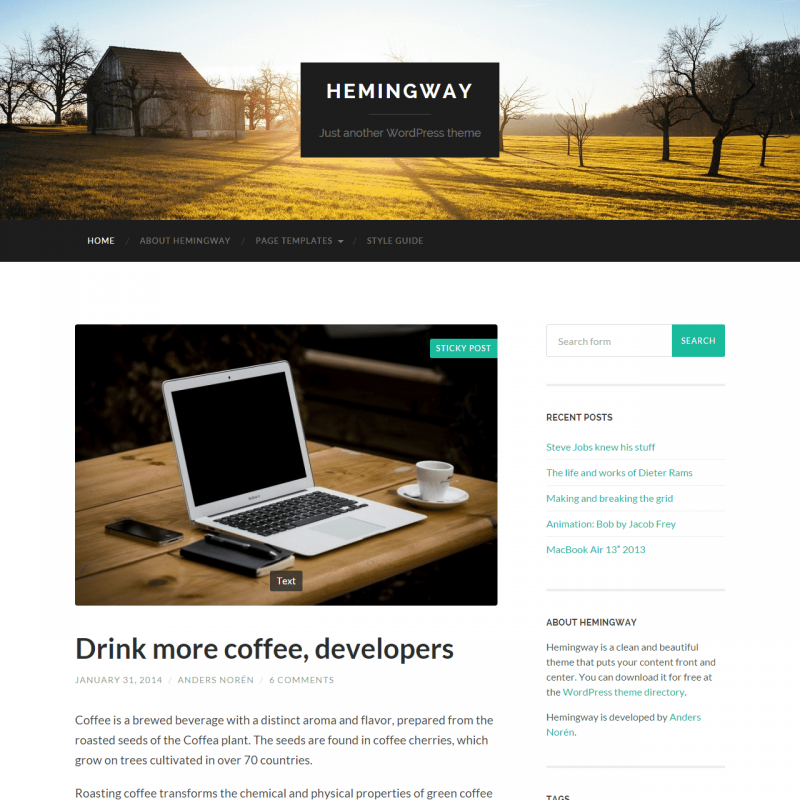 Hemingway is a simple responsive two-column theme for bloggers. You can add a full-width header image with Parallax scrolling effect, change accent color, upload your own logo, and use custom widgets (Video, Flickr and Dribbble). 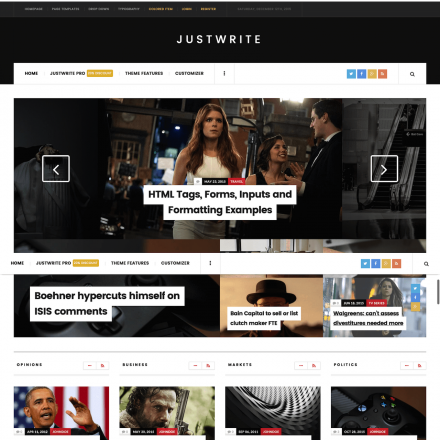 Hemingway theme supports standard, video, quote and aside post formats. 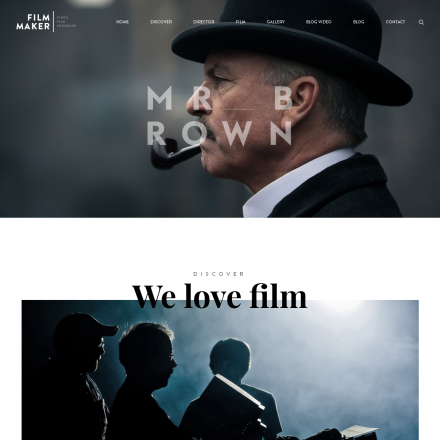 It also includes archive, fullwidth and narrow page templates. 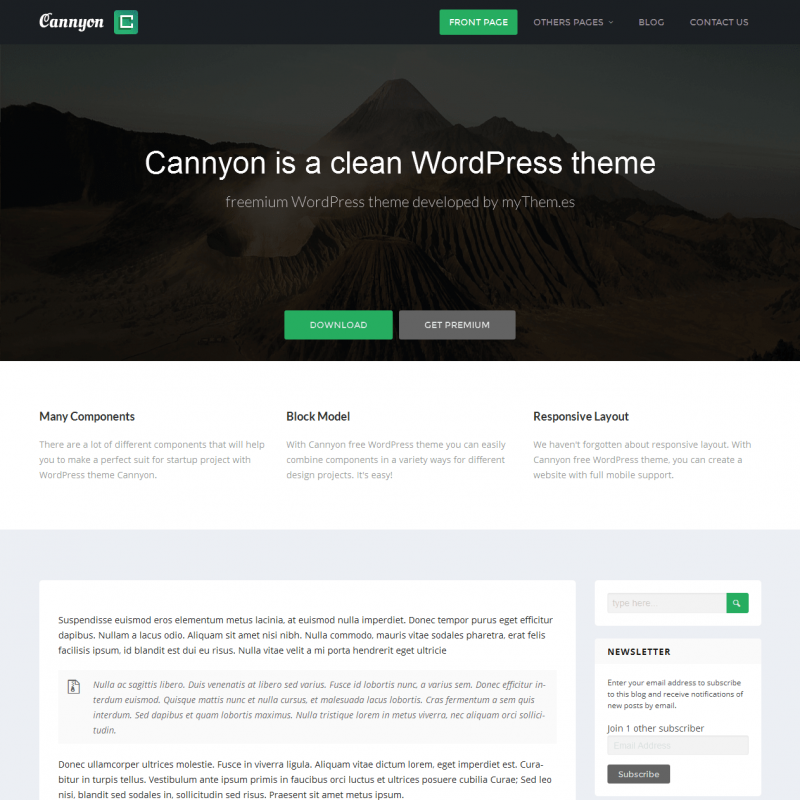 Cannyon is a free theme with accurate design and responsive layout. You can use it to create business, blog or portoflio website. The theme allows you to add your own background header image with the Parallax effect as well as header buttons, which can be used as Call To Action. You can upload image logo and custom favicon, change header and site background color. The theme allows you to add social links, custom CSS, choose between left sidebar, right sidebar or fullwidth layout. 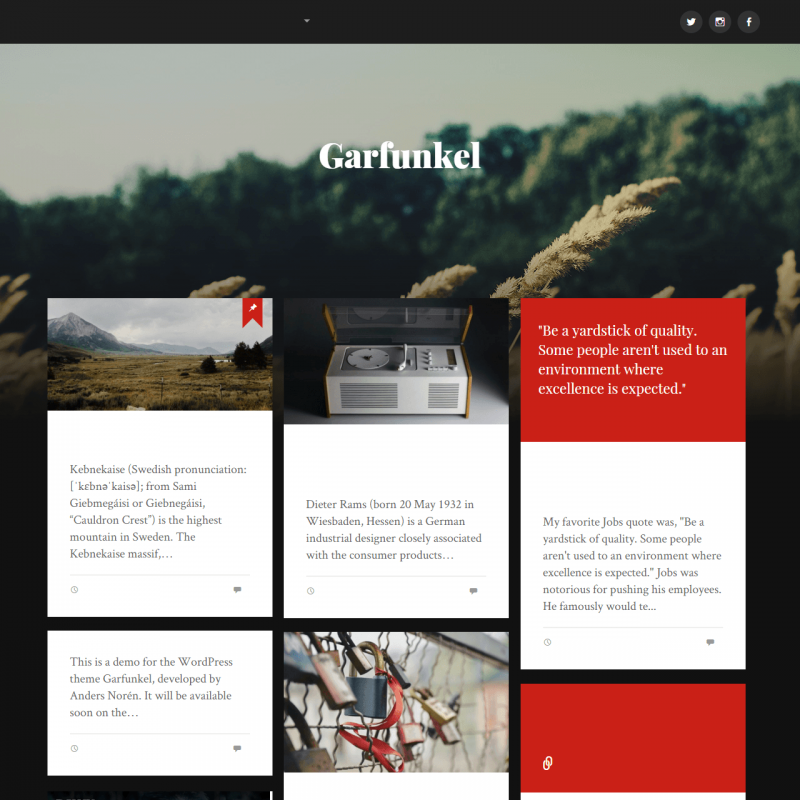 Garfunkel is a simple magazine theme with Masonry layout. 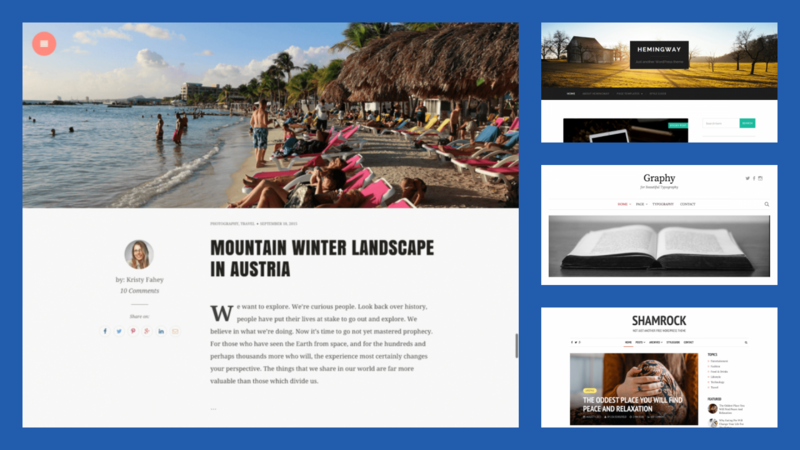 It is responsive and retina-ready, supports six post formats including quotes and galleries and six custom widgets. Editor styles and social menu icons included in the theme could be quite useful. Garfunkel theme includes archive page template. You can change the accent color, background image and upload your own logo with this theme. Garfunkel support Jetpack Infinite Scroll. 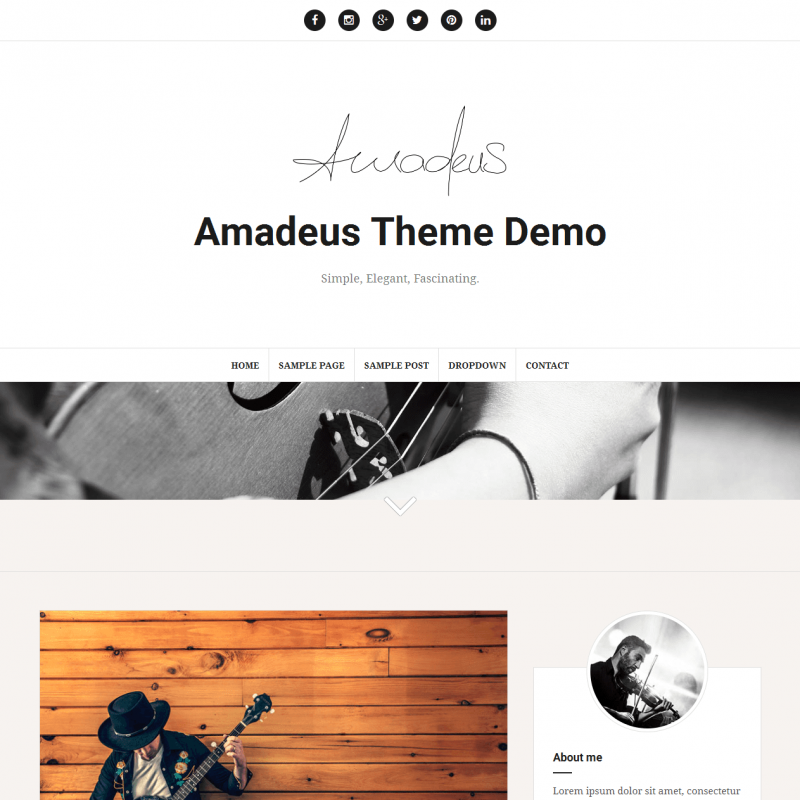 Amadeus is a powerful free WordPress theme that allows you to modify almost any aspect of your website. You can change any text or background colour on your site, define Google fonts for body copy and headings, and adjust font sizes. The theme provides the full control on site branding. You can upload your own image logo, and set it’s size, paddings, etc. You can add MetaSlider or header image, also it is possible to display the banner or slider on homepage only. 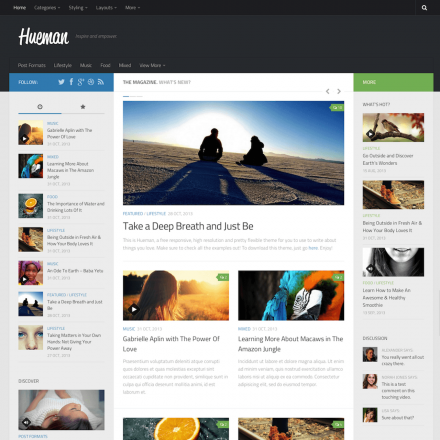 Amadeus looks fresh and minimal, and suits for any blog website. Treeson is created for any kind of business websites. The provides a variety of options to customize your header. You can upload header image, use Parallax header, header buttons, add custom logo and favicon or change header colors. The theme allows you to upload your own background image or set background color, add your copyright info and social links. 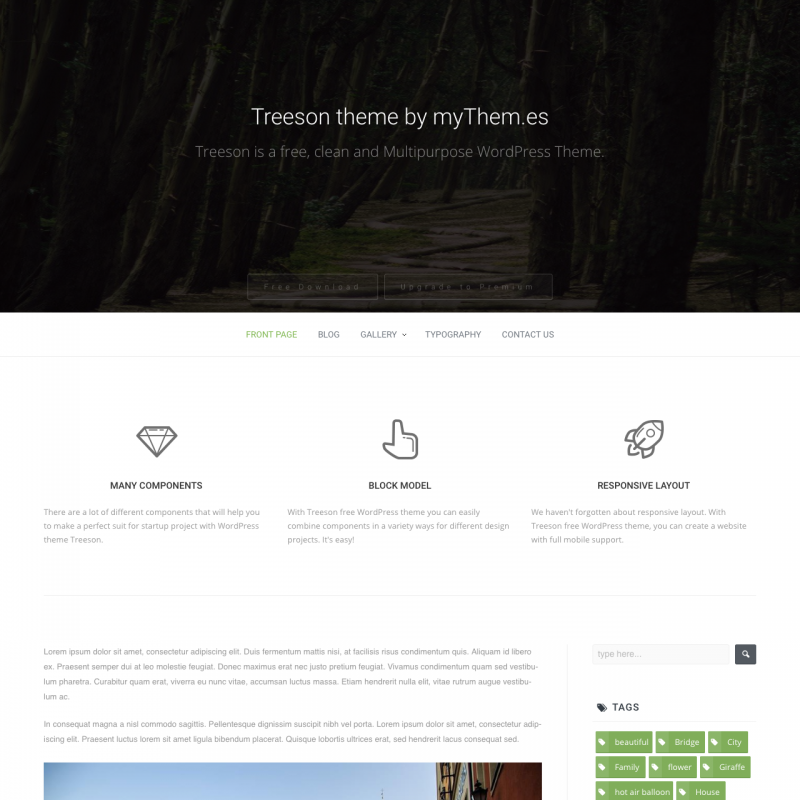 Treeson supports left/right sidebar layout and fullwidth layout. 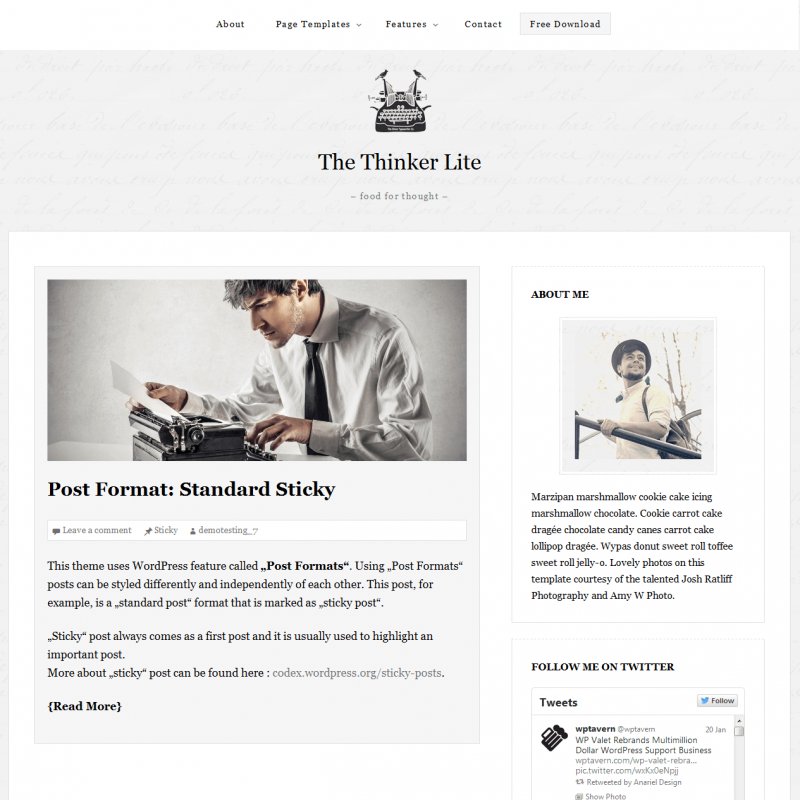 The Thinker Lite is a simple and clean WordPress theme created for blogs. This is a free version of premium The Thinker theme. 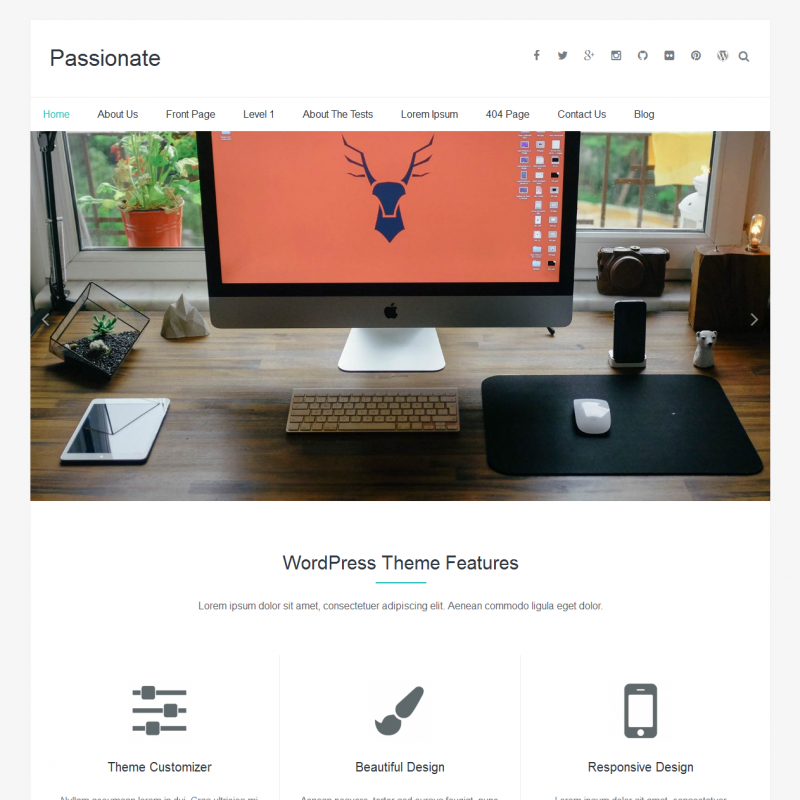 The theme supports WordPress post formats, including quotes, galleries and videos. The free version includes options for custom header image, background and custom logo. You can use sidebar widget area or three footer widget areas. The theme is fully responsive. 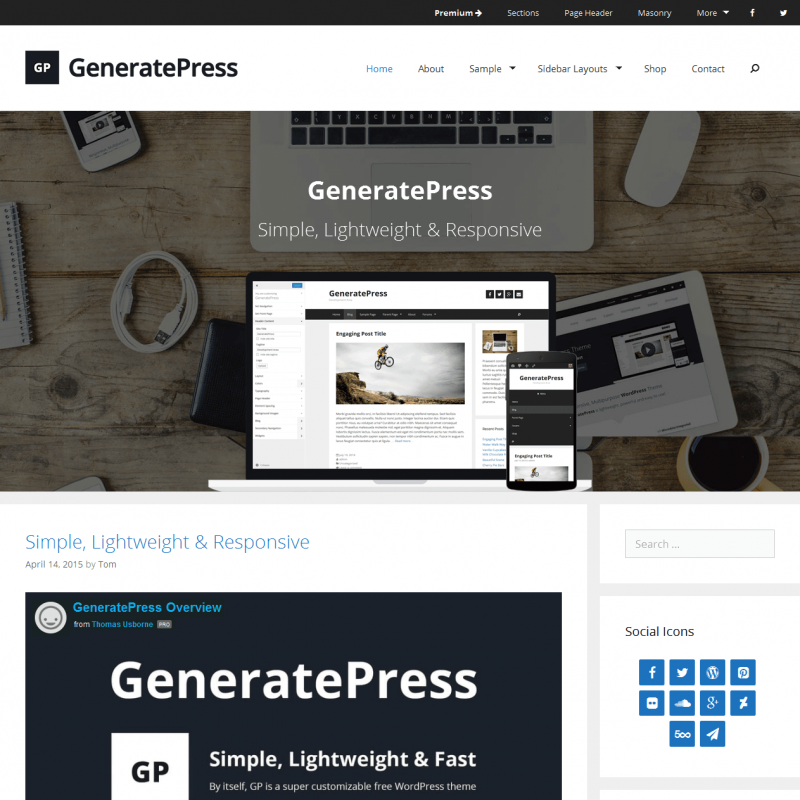 GeneratePress is a lightweight and responsive WordPress theme with powerful features. It is compatible with great popular plugins like WooCommerce, WPML, BuddyPress, bbPress and more. GeneratePress provides 8 widget areas, 5 sidebar layouts, color and typography options and more. All settings can be changed using native WordPress Customizer with a live preview. The theme is build with valid HTML and Schema.org microdata support. GeneratePress is cross browser compatible, including IE8. 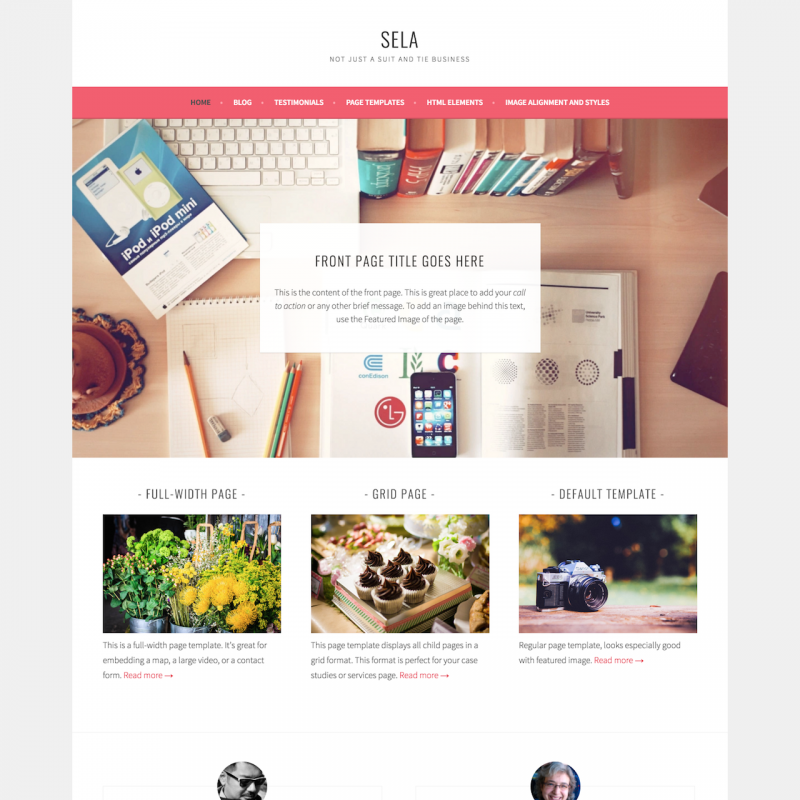 Sela is a clean WordPress theme created by Automattic for business websites and blogs. 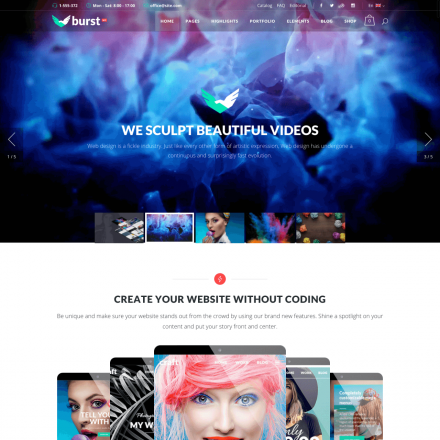 The theme includes full-width and grid page templates. You can upload your own logo and use right sidebar and three optional footer widget areas. For the homepage you can configure Testimonial and Featured sections and add widgets in tree optional front page widget areas. 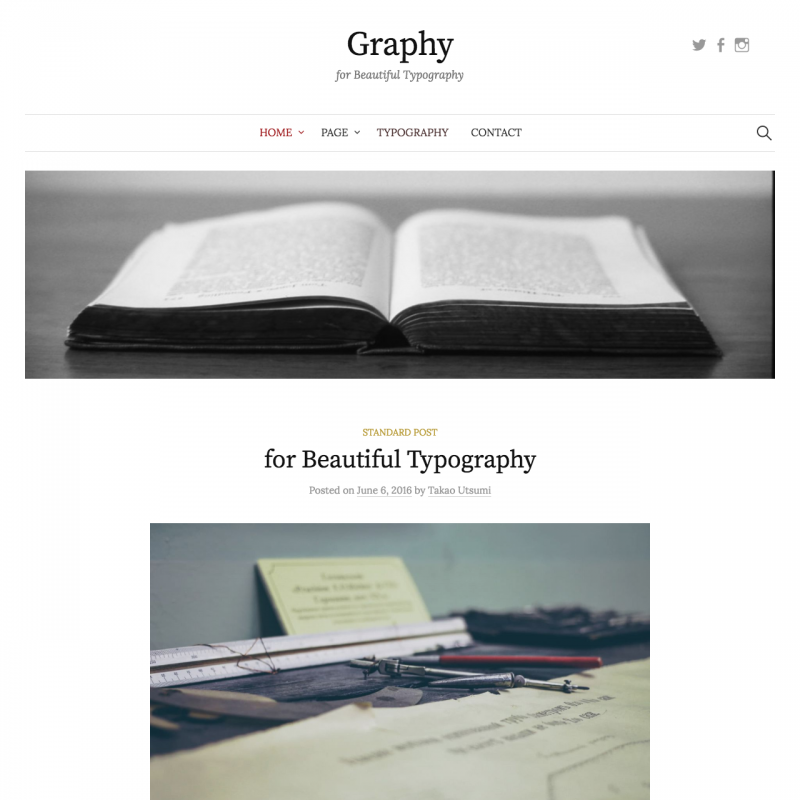 Graphy is a minimal WordPress theme with responsive design and neat typography. If you use the sidebar widget area the theme enables two columns layout. Four widget areas are also available for your website footer. Graphy theme supports custom drop-down menu, allows you to change the links color, upload header image and your logo. Top search bar and next/previous navigation between single posts would be handy for your visitors. 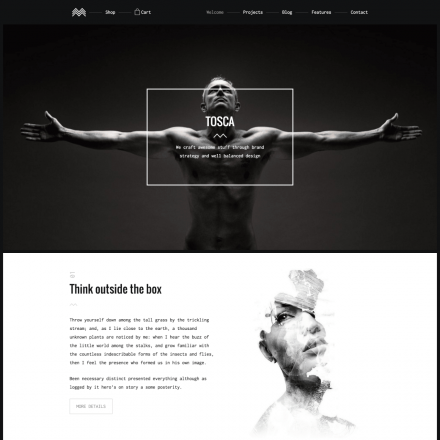 Modern theme employs the clean responsive design with modern features such as sticky header, sticky footer with scroll to top button, Schema.org markup. 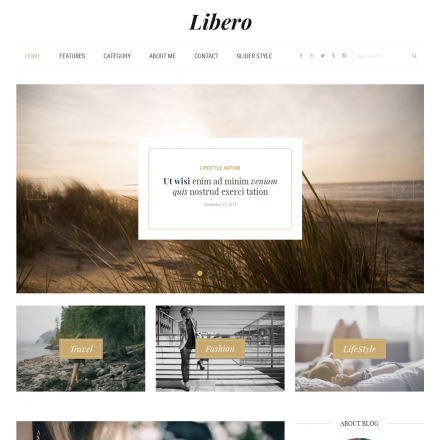 The theme features beautiful hero header, portfolio and blog sections on the homepage, related section for your single pages and full post formats support. 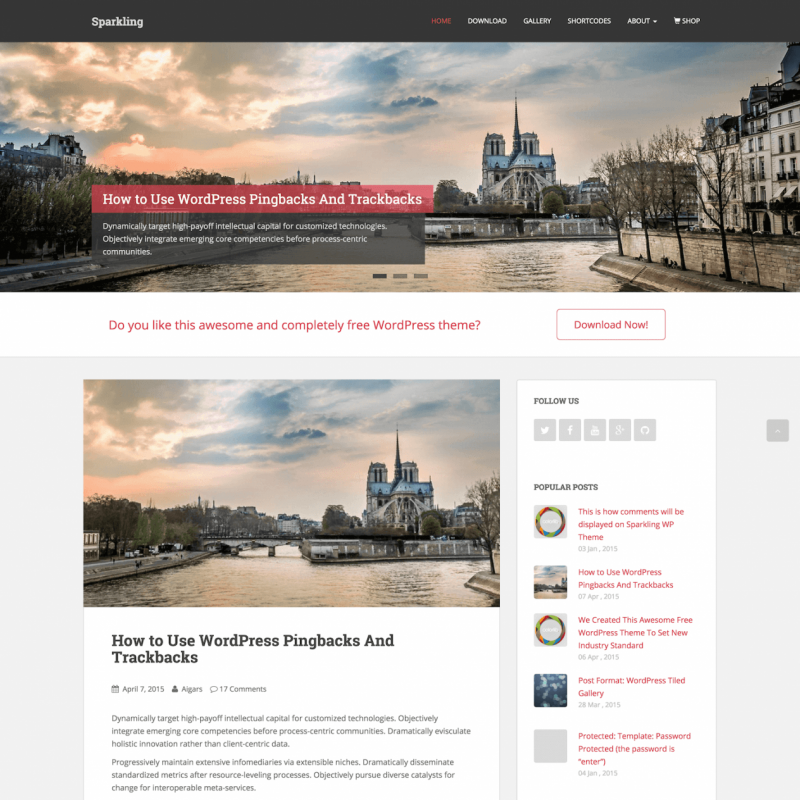 You can change background image and text logo color, as well as the color of accents using WordPress Live Customizer. There are some predefined Google-fonts to choose from for the site title, headings and body text. The manual that will help you to configure the theme is available on the author’s website. 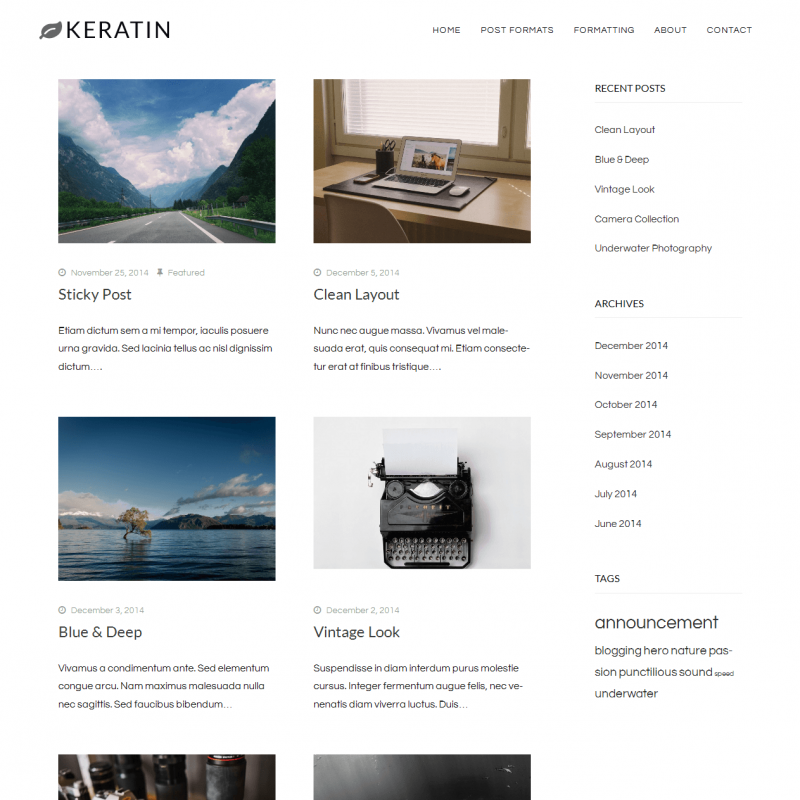 Keratin is a simple responsive WordPress theme with Masonry grid layout. 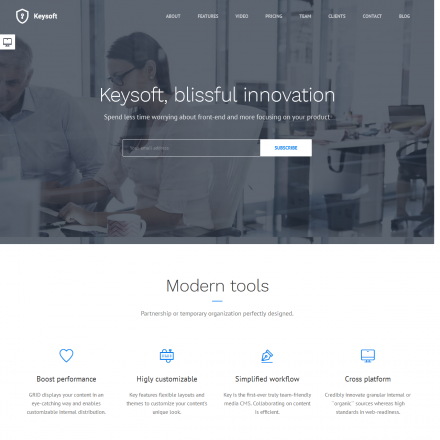 The theme features clean design and some basic customization options. You can choose between boxed or wide layout, and set your background image or color for the boxed layout. Keratin theme allows you to upload custom background image for your header, change the header text color and add your own image logo. 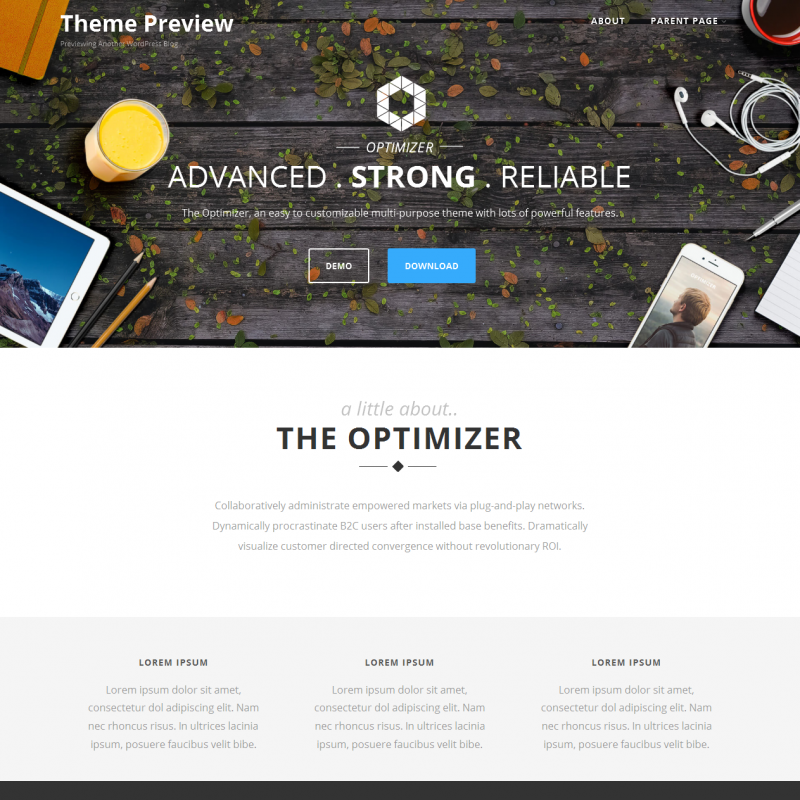 Optimizer is a flexible, customizable theme suitable both for a blog and a business website. You can select wide or boxed site layout, customize the header or footer style, design your homepage using widgets and a hero-header with a call to action button. The theme allows you to upload your logo and background image, change the color of the main content text and other elements, including complete color adjustment for the top menu. On the homepage, the menu can be made transparent. 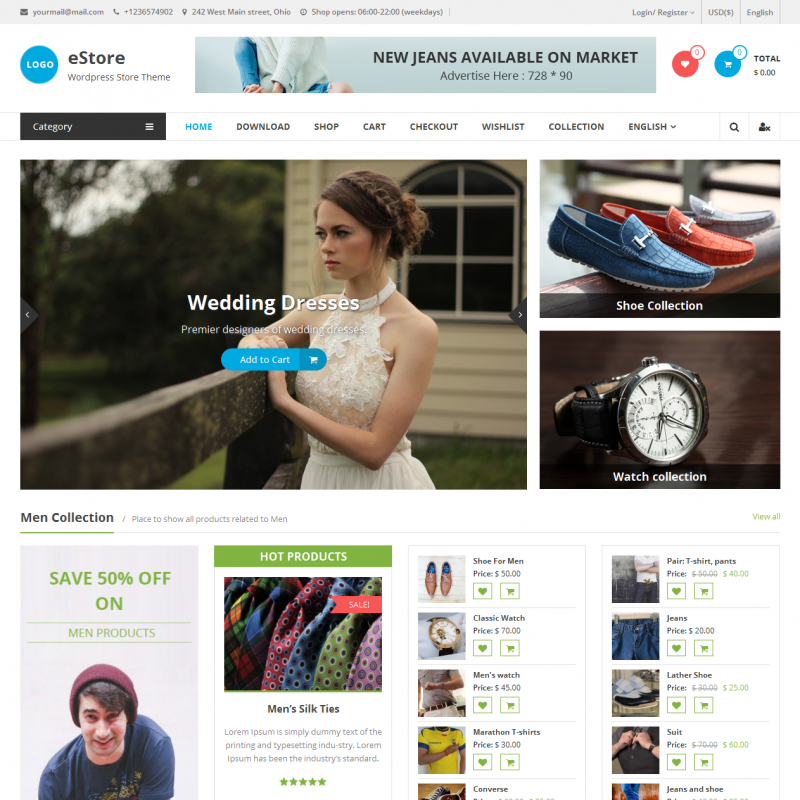 The theme supports WooCommerce, bbPress, Mailchimp, Contact Form 7.
eStore is a responsive WordPress theme supporting WooCommerce, as well as a wishlist plugin, YITH WooCommerce Wishlist. You can set different colors for categories, create product collections that can be inserted into any post. The theme offers you 10 widget areas. There are also 14 custom widgets available, including a slider, a carousel and a widget of favorite posts that can be used to build a beautiful homepage. 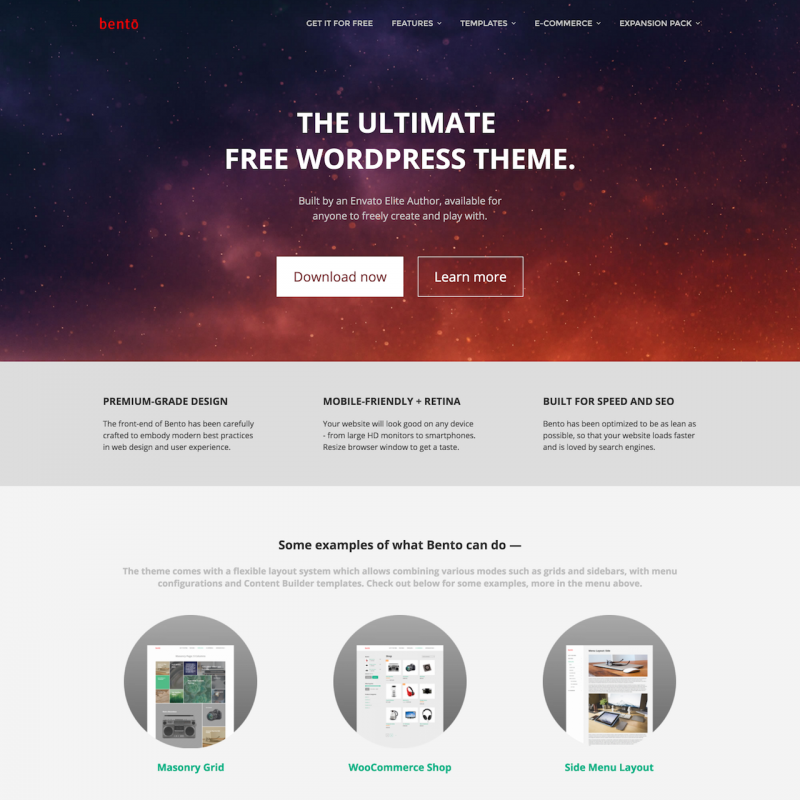 The free version of the theme allows changing the color of accents. You can select where your sidebar is located — left or right, place your content at full width, or narrow down the main column. This setting can be different for static pages, articles and archives. The theme is compatible with the WMPL and Polylang plugins. 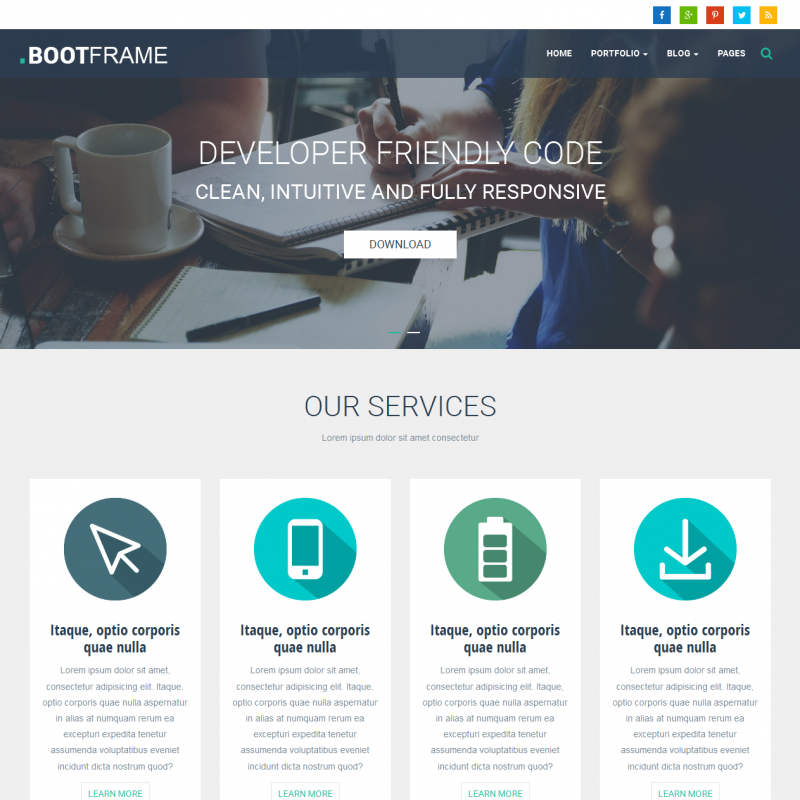 BootFrame Core WordPress theme is suitable for any business sites, including portfolio sites. 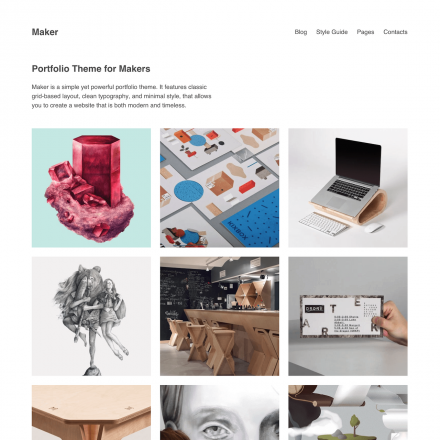 The theme allows you to create a filterable 4-column portfolio and offers a blog layout. 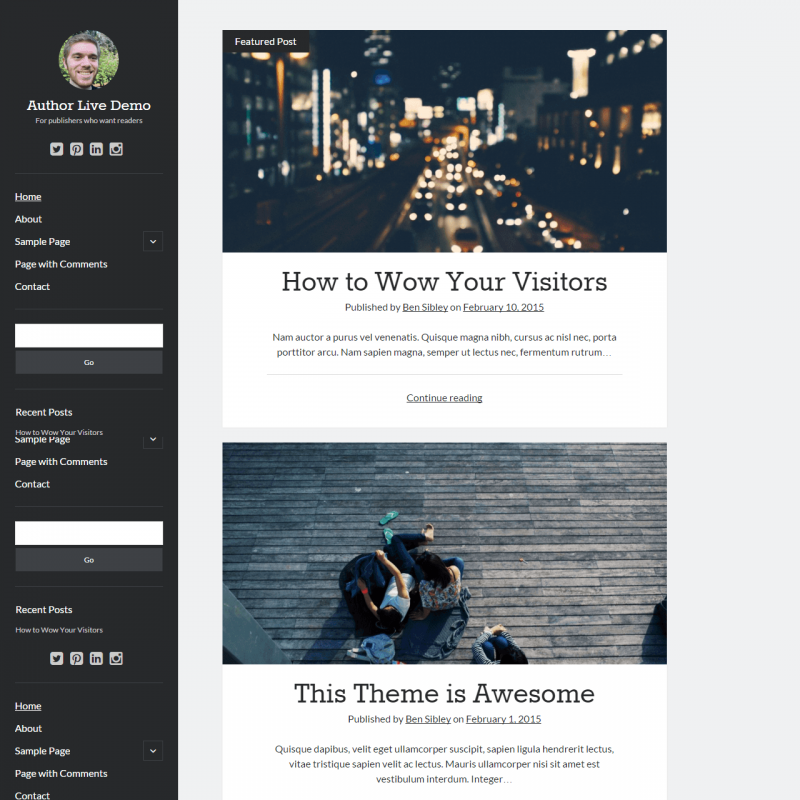 In addition, you can create landing pages with a free page builder from Site Origin, compatible with this theme. Importantly, the theme is integrated with the WooCommerce plugin. The theme allows you to change colors and fonts, upload your own logo, add social icons, position the sidebar on the left or right of the main content, set the width of the site and the sidebar, and much more. The theme is also compatible with Contact Form 7, WPML, Polylang, Shortcodes Ultimate and Meta Slider. 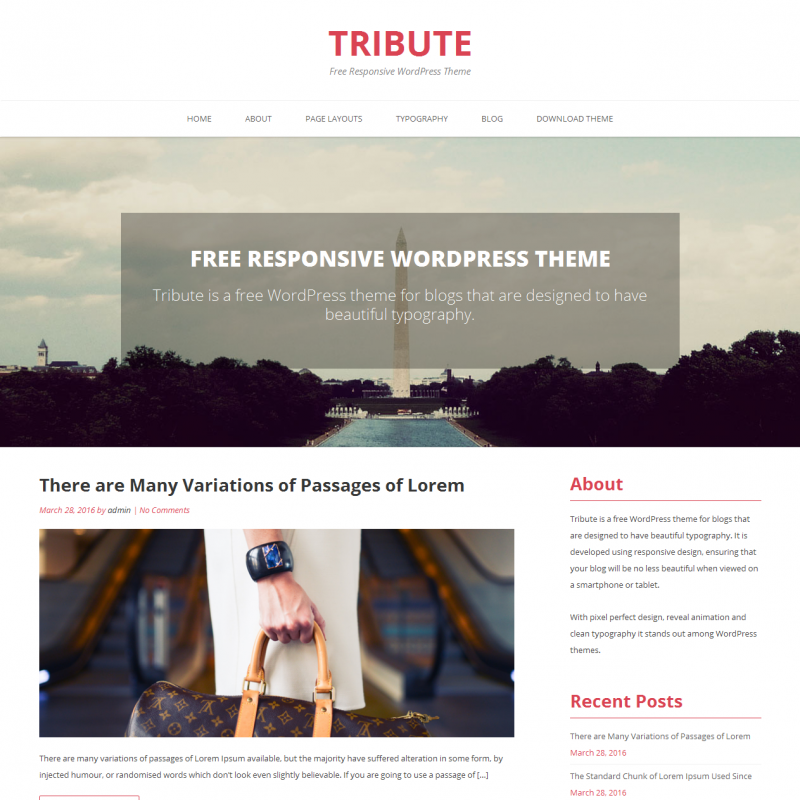 Tribute is a responsive WordPress theme for blogs with a clean design and easy setup. You can configure the main color accents and background of your site, add a banner or a slider to the homepage, upload a logo and background image for the header. You can add social icons to the site footer by creating a menu with the name “social” and adding the necessary links. The theme has a beautiful CSS3 animation. 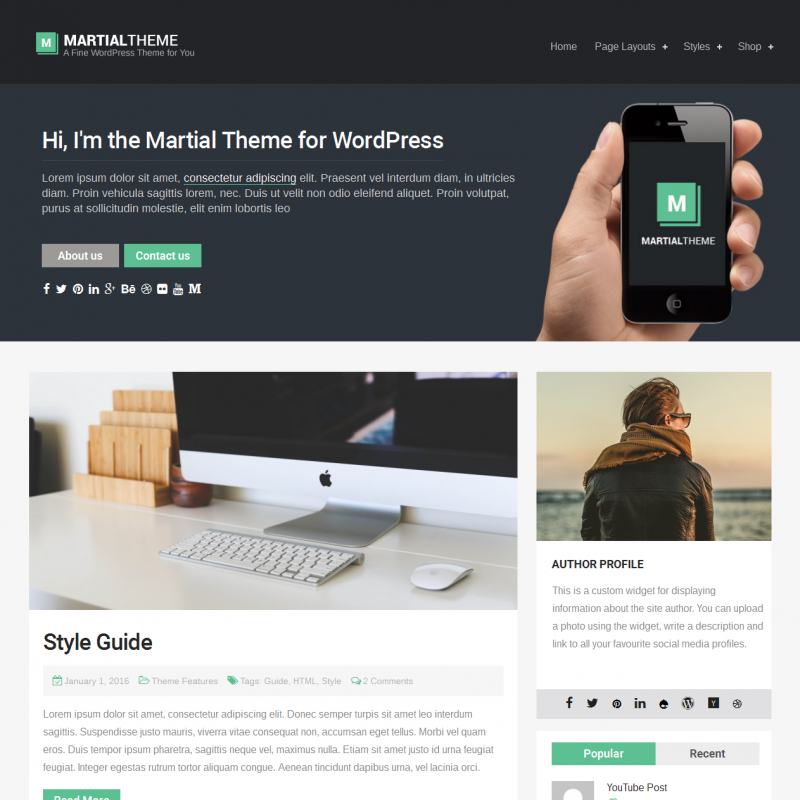 Martial is a classic blogging theme with a modern responsive design and WooCommerce support to organize a small online store. The theme has beautiful widgets for an author bio and new/popular posts. There is a navigation between posts, built-in breadcrumbs, a smooth dropdown menu. You can show your contact details in the header. You can also add links to social network profiles, your bio, and call-to-action buttons. The theme is also compatible with WPML, bbPress, ContactForm 7, Jetpack, Gravity Forms, and other popular plugins. 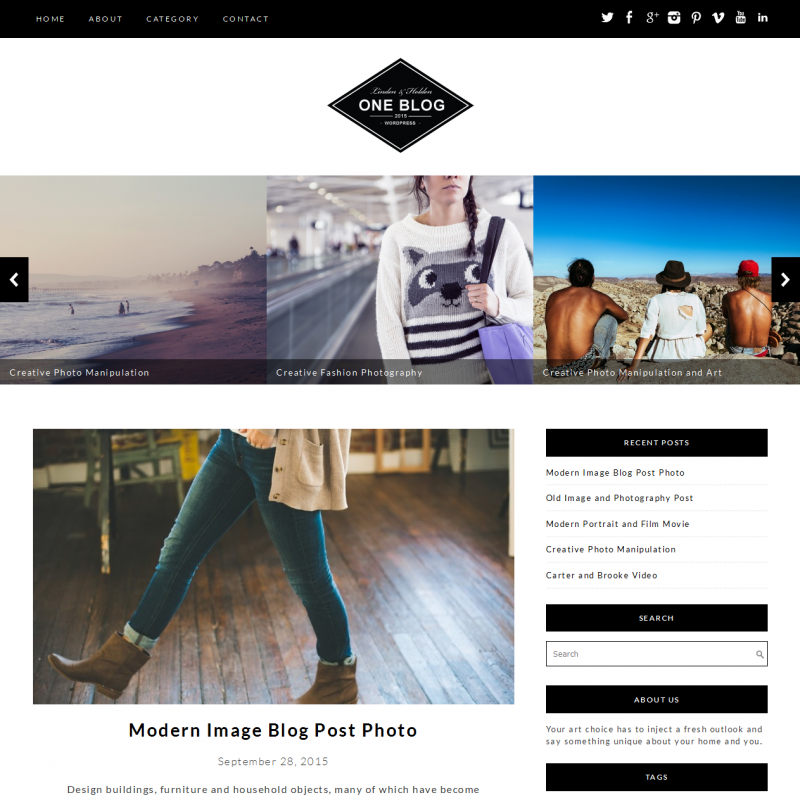 One Blog is a modern WordPress theme with a responsive layout for magazines and blogs. The header can contain a carousel. The theme provides a sticky menu, navigation between posts, four widget areas — one in the sidebar and three in the footer of the site. Using the Live Customizer, you can change the background color, upload your logo and provide links to social network profiles. Unfortunately, social network icons are made as images and do not look clear on Retina displays.